Igazeuma Okoroba works for 93.7 as a radio host. Igazeuma Okoroba is the radio host who when a tanker fire took the lives of almost 200 men in Okogbe town of Ahoada took leave from work to visit each family and went waist high in water to take resources to flood victims in 5 LGAs in Rivers state during the last flood. She has been hosting gospel shows on radio since 2000 as an undergraduate and pioneered rhythms gospel show gospel vibes in 2002. The show has brought to the fore major issues plaguing the African continent in particular including AIDS, female genital mutilation, women empowerment, street children and how Christians should respond to these issues. 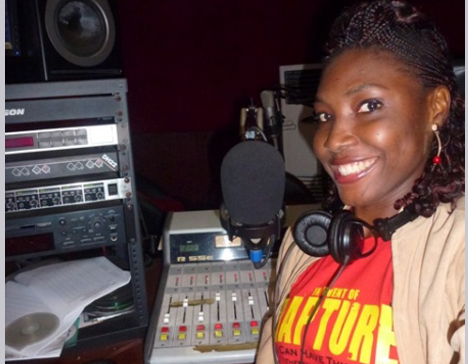 She creates a platform for Christian listeners to volunteer and be part of the solution especially with regards to the issues enumerated above.